There are additional content modifiers that can provide protocol-specific capabilities at the application layer. 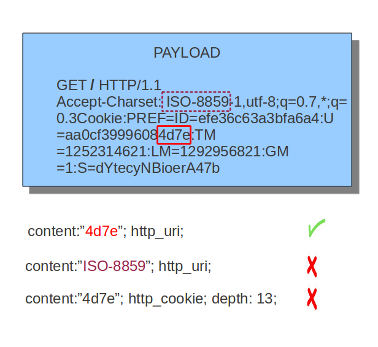 More information can be found at Payload Keywords These keywords make sure the signature checks only specific parts of the network traffic. For instance, to check specifically on the request URI, cookies, or the HTTP request or response body, etc. GET is a request method. Examples of methods are: GET, POST, PUT, HEAD, etc. 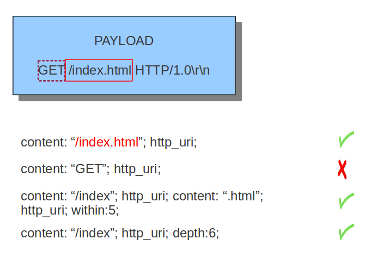 The URI path is /index.html and the HTTP version is HTTP/1.0. Several HTTP versions have been used over the years; of the versions 0.9, 1.0 and 1.1, 1.0 and 1.1 are the most commonly used today. 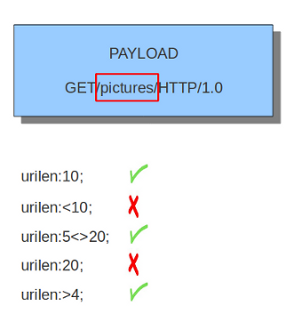 In this example, HTTP/1.0 is the HTTP version, 200 the response status code and OK the response status message. 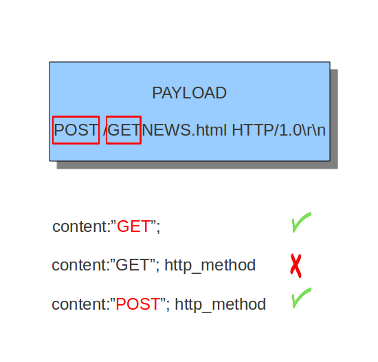 Although cookies are sent in an HTTP header, you can not match on them with the http_header keyword. Cookies are matched with their own keyword, namely http_cookie. Each part of the table belongs to a so-called buffer. 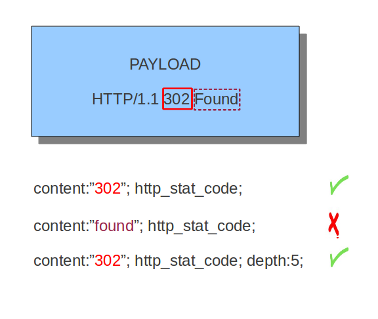 The HTTP method belongs to the method buffer, HTTP headers to the header buffer etc. A buffer is a specific portion of the request or response that Suricata extracts in memory for inspection. All previous described keywords can be used in combination with a buffer in a signature. The keywords distance and within are relative modifiers, so they may only be used within the same buffer. You can not relate content matches against different buffers with relative modifiers. With the http_method content modifier, it is possible to match specifically and only on the HTTP method buffer. The keyword can be used in combination with all previously mentioned content modifiers such as: depth, distance, offset, nocase and within. Examples of methods are: GET, POST, PUT, HEAD, DELETE, TRACE, OPTIONS, CONNECT and PATCH. With the http_uri and the http_raw_uri content modifiers, it is possible to match specifically and only on the request URI buffer. The keyword can be used in combination with all previously mentioned content modifiers like depth, distance, offset, nocase and within. The uri has two appearances in Suricata: the raw_uri and the normalized uri. The space for example can be indicated with the heximal notation %20. To convert this notation in a space, means normalizing it. It is possible though to match specific on the characters %20 in a uri. This means matching on the raw_uri. The raw_uri and the normalized uri are separate buffers. So, the raw_uri inspects the raw_uri buffer and can not inspect the normalized buffer. The uricontent keyword has the exact same effect as the http_uri content modifier. uricontent is a deprecated (although still supported) way to match specifically and only on the request URI buffer. When authoring new rules, it is recommended that the http_uri content modifier be used rather than the deprecated uricontent keyword. The urilen keyword is used to match on the length of the request URI. It is possible to use the < and > operators, which indicate respectively smaller than and larger than. You can also append norm or raw to define what sort of buffer you want to use (normalized or raw buffer). The http_protocol inspects the protocol field from the HTTP request or response line. If the request line is ‘GET / HTTP/1.0rn’, then this buffer will contain ‘HTTP/1.0’. The http_request_line forces the whole HTTP request line to be inspected. With the http_header content modifier, it is possible to match specifically and only on the HTTP header buffer. This contains all of the extracted headers in a single buffer, except for those indicated in the documentation that are not able to match by this buffer and have their own content modifier (e.g. http_cookie). The modifier can be used in combination with all previously mentioned content modifiers, like depth, distance, offset, nocase and within. Note: the header buffer is normalized. Any trailing whitespace and tab characters are removed. 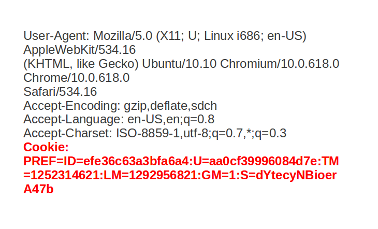 See: https://lists.openinfosecfoundation.org/pipermail/oisf-users/2011-October/000935.html. To avoid that, use the http_raw_header keyword. With the http_cookie content modifier, it is possible to match specifically and only on the cookie buffer. The keyword can be used in combination with all previously mentioned content modifiers like depth, distance, offset, nocase and within. Note that cookies are passed in HTTP headers, but are extracted to a dedicated buffer and matched using their own specific content modifier. 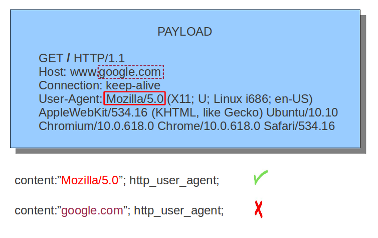 The http_user_agent content modifier is part of the HTTP request header. It makes it possible to match specifically on the value of the User-Agent header. It is normalized in the sense that it does not include the _”User-Agent: “_ header name and separator, nor does it contain the trailing carriage return and line feed (CRLF). The keyword can be used in combination with all previously mentioned content modifiers like depth, distance, offset, nocase and within. Note that the pcre keyword can also inspect this buffer when using the /V modifier. Normalization: leading spaces are not part of this buffer. So “User-Agent: rn” will result in an empty http_user_agent buffer. The http_user_agent buffer will NOT include the header name, colon, or leading whitespace. i.e. it will not include “User-Agent: “. The http_user_agent buffer does not include a CRLF (0x0D 0x0A) at the end. If you want to match the end of the buffer, use a relative isdataat or a PCRE (although PCRE will be worse on performance). If a request contains multiple “User-Agent” headers, the values will be concatenated in the http_user_agent buffer, in the order seen from top to bottom, with a comma and space (“, “) between each of them. Using the http_user_agent buffer is more efficient when it comes to performance than using the http_header buffer (~10% better). Sticky buffer to match on the HTTP Accept header. Only contains the header value. The \r\n after the header are not part of the buffer. Sticky buffer to match on the HTTP Accept-Encoding header. Only contains the header value. The \r\n after the header are not part of the buffer. Sticky buffer to match on the HTTP Accept-Language header. Only contains the header value. The \r\n after the header are not part of the buffer. Sticky buffer to match on the HTTP Connection header. Only contains the header value. The \r\n after the header are not part of the buffer. Sticky buffer to match on the HTTP Content-Type headers. Only contains the header value. The \r\n after the header are not part of the buffer. Use flow:to_server or flow:to_client to force inspection of request or response. Sticky buffer to match on the HTTP Content-Length headers. Only contains the header value. The \r\n after the header are not part of the buffer. To do a numeric inspection of the content length, byte_test can be used. Sticky buffer to match on the HTTP Referer header. Only contains the header value. The \r\n after the header are not part of the buffer. Inspect the start of a HTTP request or response. This will contain the request/response line plus the request/response headers. Use flow:to_server or flow:to_client to force inspection of request or response. The buffer contains the normalized headers and is terminated by an extra \r\n to indicate the end of the headers. Inspect a buffer only containing the names of the HTTP headers. Useful for making sure a header is not present or testing for a certain order of headers. Buffer starts with a \r\n and ends with an extra \r\n. With the http_client_body content modifier, it is possible to match specifically and only on the HTTP request body. The keyword can be used in combination with all previously mentioned content modifiers like distance, offset, nocase, within, etc. Note: how much of the request/client body is inspected is controlled in the libhtp configuration section via the request-body-limit setting. With the http_stat_code content modifier, it is possible to match specifically and only on the HTTP status code buffer. The keyword can be used in combination with all previously mentioned content modifiers like distance, offset, nocase, within, etc. With the http_stat_msg content modifier, it is possible to match specifically and only on the HTTP status message buffer. The keyword can be used in combination with all previously mentioned content modifiers like depth, distance, offset, nocase and within. The http_response_line forces the whole HTTP response line to be inspected. With the http_server_body content modifier, it is possible to match specifically and only on the HTTP response body. The keyword can be used in combination with all previously mentioned content modifiers like distance, offset, nocase, within, etc. Note: how much of the response/server body is inspected is controlled in your libhtp configuration section via the response-body-limit setting. 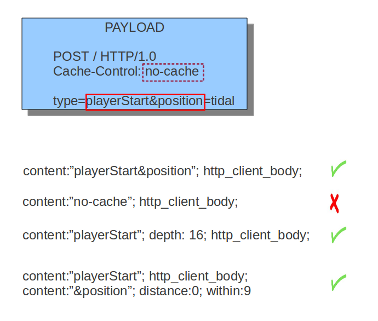 Using http_server_body is similar to having content matches that come after file_data except that it doesn’t permanently (unless reset) set the detection pointer to the beginning of the server response body. i.e. it is not a sticky buffer. http_server_body will match on gzip decoded data just like file_data does. Since http_server_body matches on a server response, it can’t be used with the to_server or from_client flow directives. further notes at the file_data section below. Sticky buffer to match on the HTTP Server headers. Only contains the header value. The \r\n after the header are not part of the buffer. Sticky buffer to match on the HTTP Location headers. Only contains the header value. The \r\n after the header are not part of the buffer. 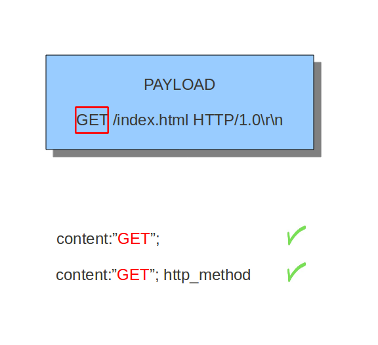 With the http_host content modifier, it is possible to match specifically and only the normalized hostname. The http_raw_host inspects the raw hostname. The keyword can be used in combination with most of the content modifiers like distance, offset, within, etc. The nocase keyword is not allowed anymore. Keep in mind that you need to specify a lowercase pattern. 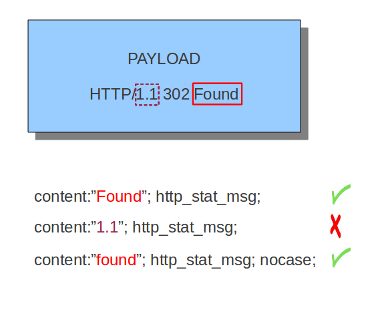 The http_host and http_raw_host buffers are populated from either the URI (if the full URI is present in the request like in a proxy request) or the HTTP Host header. If both are present, the URI is used. The http_host and http_raw_host buffers will NOT include the header name, colon, or leading whitespace if populated from the Host header. i.e. they will not include “Host: “. The http_host and http_raw_host buffers do not include a CRLF (0x0D 0x0A) at the end. If you want to match the end of the buffer, use a relative ‘isdataat’ or a PCRE (although PCRE will be worse on performance). The http_host buffer is normalized to be all lower case. 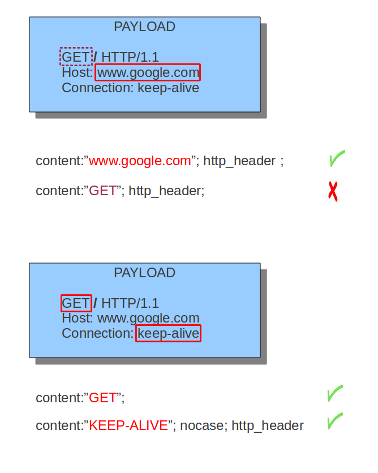 The content match that http_host applies to must be all lower case or have the nocase flag set. http_raw_host matches the unnormalized buffer so matching will be case-sensitive (unless nocase is set). If a request contains multiple “Host” headers, the values will be concatenated in the http_host and http_raw_host buffers, in the order seen from top to bottom, with a comma and space (“, “) between each of them. With file_data, the HTTP response body is inspected, just like with http_server_body. The file_data keyword works a bit differently from the normal content modifiers; when used in a rule, all content matches following it in the rule are affected (modified) by it. The file_data keyword affects all following content matches, until the pkt_data keyword is encountered or it reaches the end of the rule. This makes it a useful shortcut for applying many content matches to the HTTP response body, eliminating the need to modify each content match individually. As the body of a HTTP response can be very large, it is inspected in smaller chunks. How much of the response/server body is inspected is controlled in your libhtp configuration section via the response-body-limit setting. # set 0 for unlimited. If a HTTP body is using gzip or deflate, file_data will match on the decompressed data. Negated matching is affected by the chunked inspection. E.g. ‘content:!”<html”;’ could not match on the first chunk, but would then possibly match on the 2nd. To avoid this, use a depth setting. The depth setting takes the body size into account. Assuming that the response-body-minimal-inspect-size is bigger than 1k, ‘content:!”<html”; depth:1024;’ can only match if the pattern ‘<html’ is absent from the first inspected chunk.